It's Memorial Day. That solemn U.S. holiday to honor our Soldiers, Sailors, Airman and Marines who lost their lives in battle. Over the decades it has become the "unofficial start to summer" and the beginning of grilling season for those pansies who can't light charcoal while wearing a winter jacket. It's that long weekend break from the graduation open houses. And it has also become a "Thank a Vet and Post a Patriotic Picture on Facebook Day", which I am (in part) guilty of. Today I posted the above quote from General Powell and the very moving photo. To me, that summed up nicely what this day is really all about. Those marble headstones across our nation's cemeteries and the marble crosses and Stars of David in France. Today is about what lays under the marble markers. Our Soldiers, Sailors, Airman and Marines who lost their lives in battle. I thought the above picture was perfect. The perfectly align crosses in the perfectly manicured grounds calmly and quietly embraced in a fog. Haunting and peaceful at the same time. It is almost ironic how those perfectly aligned crosses mark where under that perfectly manicured ground lay many mangled bodies of our youth. Young Soldiers who died a death far from the peaceful, quiet, organized character of their final resting place. Many of them died a death in loud, confusing unorganized horror that is war. On the beaches of Normandy and battlefields of Europe filled with shouts, screams, explosions, chaos, confusion, anger, pain and fear. The quote on the other hand, while very solemn and well meant, is not entirely accurate. 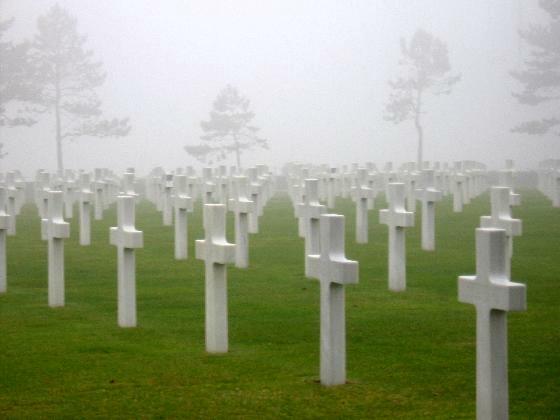 Let's be honest, at the end of war, we pretty much always end up with more foreign land than a cemetery. The United States very rarely leaves. I'm not going to claim we are an Imperial Nation who takes over for it's best interests, like an anti-war protester. I don't feel that way. If that were the case, we would have a lot more territories besides a few islands in the Caribbean and South Pacific. But we have a Naval base in Communist Cuba that's a leftover from the Spanish American War. Bases in Germany and Japan from World War II and tens of thousands of troops on the Korean Peninsula. Not to mention the Middle East. Like I said, we rarely leave. While we are not an imperial nation, we are kind of the world's police force. I always thought that was a role more suited for the United Nations, but they are more like the world's mall security. If they see trouble they give a warning, then call the real police if trouble continues. While I still really like General Powell's quote, I wish is was more accurate. I wish we weren't the world's police. It would really reduce the number of white marble markers I think about on this day. But just like the stronger and wealthier people need to take care of the less fortunate, so do the stronger and wealthier nations.